Rusty The Elephant lives in the circus. As a young boy, Rusty believed that he was destined for greater things. 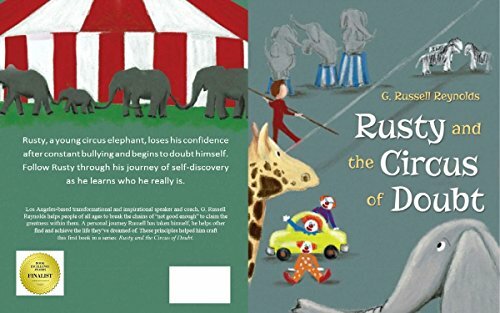 The Circus Boss berates Rusty when he doesn’t act like a “normal” elephant. All the other animals bully him. Over time, Rusty begins to lose confidence in himself. One night he cries out for help. A monkey appears and informs Rusty that he has the key to Rusty’s freedom. This monkey works step by step to encourage self-confidence and independence in Rusty. Soon Rusty no longer cares what the other animals think of him. Will Rusty ever achieve his dreams? This International Book Excellence winner contains beautiful illustrations and a message to encourage children who experience a lack of self-confidence and fear of not fitting in with the crowd. While the book is targeted at children in the six to nine-year-old age group, I feel it is appropriate for older children as well. Well-written and highly recommended for all ages. Sounds like a great read for children. This would make a perfect gift for my niece. I hope that she will enjoy reading it.